A man who has got his hands on quite a few trophies this year, Larne Tech ‘old boy’ Gary Haveron, was the special guest at the amateur league club’s recent awards night. While the Craigyhill outfit ended up sixth in Division 1A, they were only two points adrift of Abbey Villa in third. Although there was a sizeable 10-point gap between third and second-placed Crumlin United. At least there are still some young talented players coming through; none more so than Matt Devine, son of ex-Northern Ireland international John. He grabbed the manager’s and the supporters’ vote for the First Team Player of the Year. There was also a special award to Niall McAllister, to mark his selection for the Northern Amateur League Representative squad. 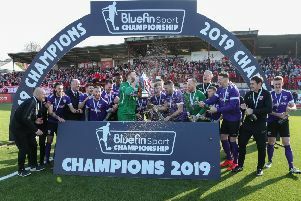 Larne Tech’s Director of Football, Paul Hardy, announced the following winners, who received their awards from Carrick Rangers first-team coach, Gary Haveron. First-team: Manager’s Player of the Year, Matt Devine; Players’ Player of the Year, Martin Steele; Supporters’ Player of the Year, Matt Devine; Leading Goalscorer, Lee Thompson. Second-team: Manager’s Player of the Year, Dwayne McMullan; Players’ Player of the Year, Aaron Wright; Leading Goalscorer; Chris Steele. Clubman of the Year, Aaron Mulvenna; Young Player of the Year, Karl Houston; Seymour Merit Award for services to the club, Eddie Russell. Larne Tech Old Boys would like to thank their sponsors for their fantastic support throughout the season: Thatch Bar; Tech Trade Recruiting; P&O Ferries (Official); Carnet Car Sales, Roy Webb; Greenfingers NI, Davy Wilson, and Johnny Hastings, Money Matters. The Tech would like to thank Marty McToal and staff for the excellent catering for the awards night.